Shaklee Omega Guard is extracted from cold water deep sea fish (sardines, mackerel, herring, anchovies) along the coast of Japan, not from fish liver oil (excessive intake of fish liver oil will cause toxic), Shaklee fish oil is 3 times more density than cod liver oil, it is the source of the most natural healthy EPA, DHA, ALA. Comparing with Omega-3 products in the market, Shaklee’s Omega Guard contains all 7 types of Omega-3, with the highest proportion in DHA. 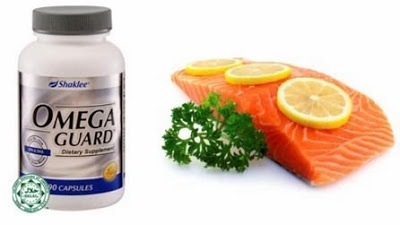 One serving of omega guard provides 905mg of EPA and DHA omega 3 fatty acids. Most manufacturers use high pressure distillation method to extract fish oil, however this method not only destroy some of the nutrient, it is also not able to filter heavy metal content. Shaklee employ ultrapure pharmaceutical grade latest technology – triple molecule filtration and low pressure distillation process to extract the purest and most natural Omega-3 fish oil, any contaminants which include lead, mercury, arsenic, cadmium, dioxins and PCDs are removed. #Essential fatty acides – Omega-3 is essential fatty acid which cannot be produced by our body, therefore we must take from food. Plant base Omega-3 cannot be converted into EPA and DHA effectively by our body. Omega-3 helps the secretion of prostaglandin more effectively in preventing prostatomegaly and urination problems arising from andrepause. It also balances the changes in women’s hormones concentration that cause PMS, for smooth and ruddy skin complexion. #Prevents bloods vessel disease and stroke – DHA and EPA can resist thrombosis, lower high blood pressure and blood concentration, loosen and smooth blood vessel, silky smooth blood circulation, therefore it is effective to improve high blood pressure and stiff neck or headache. It also lower cholesterol, suppresses harmful blood clot in the body, lower triglycerides and LDL cholesterol, control obesity conditions and prevents arteriosclerosis, myocardial infarction, heart disease and stroke. #Helps the development of foetus brain and improves memory – DHA is the main nutrient for brain it is crucial in the last 3 months development of foetus brain, nervous system and retina. Breast milk contain generous amount of DHA. DHA improves memory and learning ability, prevents Alzheimer’s disease, improves vision, hearing sense and prevents migraine. #Enhances immune system and nourishes lungs – Regulates immune system, for instance, improves skin allergies, psoriasis, hay fever, bronchitis, asthma, hepatitis, lupus erythematosus and kidney disease. #Improves arthritis – Fatty acids in Omega-3 dissolve into cartilage tissue, this is to prevent the destruction of enzymes that form cartilage tissue. It prevents and improves arthritis, join pains, gout effectively. #Improves insomnia and stress – It has been proven that EPA and DHA has the ability to stabilise emotions and improves mental health, which include depression, stress, anxiety, neurasthenia, insomnia, autism, hyperactivity of children and schizophrenia. Why cold water sea fish? In the 1970s, a Nobel Prize Winner American scientist discovered a secret: Eskimos living in different environment did have different health conditions. Eskimos living in Greenland of Denmark catch fish for a living: coronary heart disease is almost none, no asthma, psoriasis, high blood pressure, diabetes. However, Eskimos living North America are hunters and meat are their main food; the high cholesterol diet has caused a lot of coronary heart disease. Further research discovered the truth about cold water fish: Sea water fish highly contain unsaturated fatty acids i.e. EPA and DHA that can lower blood fats, suppress the accumulation of blood platelet and delay the formation of thrombus, treat asthma and skin allergies effectively. Small number of people will burp with fishy smell after taking fish oil, recommend to consume the fish oil before meal or on empty stomach. Fish oil lubricates the blood vessel which will thin the blood for smooth blood flow and delay the thickening of food. Therefore, patients going for surgery and pregnant women going to labour are not recommended to consume fish oil.